i created a solar heater with 20m x 38mm corrugated pond pipe, inside a 1m x 1m box with perspex on top. 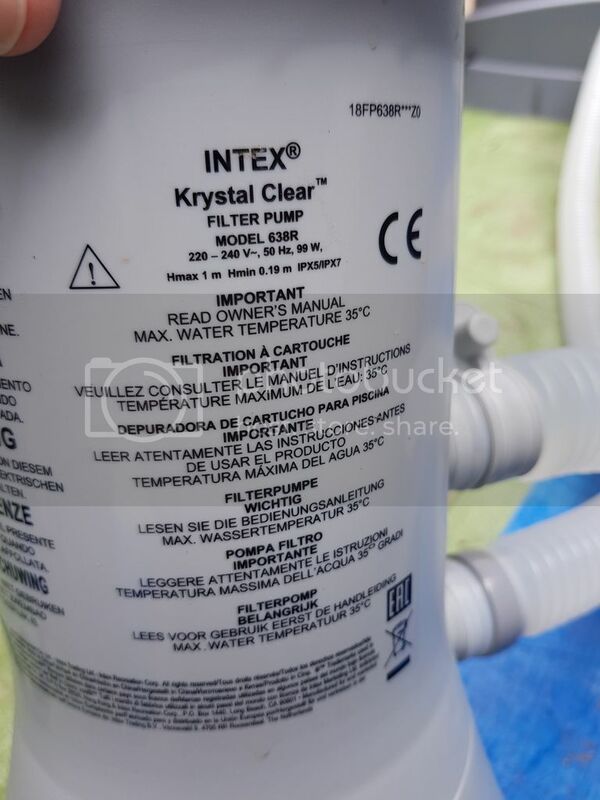 i bought a more powerful pump/filter for the pool in preparation and after getting the air out it was working but was going through too quickly and was only warming the water a little even on a hot day. so i bought the same materials again and created a second so the water goes through a longer length and through two 'hot boxes'. i connected the two up in tandem and got them running but struggled to get the water around. after bleeding some air from one of the joints by loosening a jubilee clip it was looking like it would work then both, BOTH!, sprung a leak. so i have started a return for the pipe. either it was faulty or i expected too much of it but the sales info certainly didnt mention anything about pressures and i dont think it was under a large amount of pressure anyway. i'm now looking for 2 x 20m or 30m pipe but think this time rubber hose might be best. maybe 15mm ID. i'd certainly have more confidence in it. 1) with the pools standard pipe being 38mm i had bought couplers to drop it down to the 32mm. if i get hose with about 15mm ID, would it possible to join the 38mm to 15mm somehow? 2) would it cause any problems with the pump related to bottle necks, pressure etc going from that bigger diameter? 3) any suggestions for what pipe without breaking the bank?. i've found some but dont know whether i can put a link here or mention the online store. Not sure on the watts but I was going to buy the bigger pump anyway as the one that came with the pool wasnt cleaning as good as i wanted. The 1m x 1m is quite large when you coil up 20m+ of pipe and was fairly heavy to get onto the shed roof so any bigger and it would have been awkward to get up there. When i turned off the pump for 15 minutes then back on, the water that had been sitting in the pipes came out like a kettle of hot water so there was plenty of heat but it was just going through quicker than it could heat it when left on. It has also got to do with the flow rate. It really needs to flow slowly, I would have said the pipe you used is too big in diameter. Why not buy a radiator, paint it matt black and put that in a box. This pump (and its set up) could you explain more. Firstly the pool is about 8000l. The single heat box warmed it about 4 degrees on a hot day which is no worse than the actual pool heater from the same manufacturer which said it would heat 1 degree in 4 hours. The pump is - Capacity : 800 gal./h (3,028 L/h) & System flow rate 580 gal./h. I realise the heat increase will still be slow but as mentioned above, that's to be expected and the proper heaters don't do any better. I'm simply hoping to improve it a bit using 2. I'm not looking whether or not to do it, i already have and have spent the money now so just want help with the type and diameter of hose to use. To heat 8000 litres by 1 degree in 4 hours takes around 2.5kW/hr of energy and at the approximate rate of 15p/kwhr would cost 60p. This assumes perfect insulation and no latent heat loss. I don't know the calculation for latent heat loss over that period but it will be significant unless it can be countered by 'daylight' solar heating. A decent SWH panel in a 'hot' country can deliver around 300W of heating per square meter so would reduce the heating cost by around 1/8th (or about 2p per hour). 2p equates to around 140 watts (140whrs) so if you added a pump that was 140 watts or more then you are actually INCREASING the cost of heating your water. This doesn't include the cost of manufacture/installation of the SWH panel etc. The pump would be out on anyway either the night before or the morning of an impending warm or hot day to clean the pool and mix the chemicals ready for swimming late afternoon. So I've already accepted these costs and would have replaced the filter for the better one anyway. As such, as mentioned, the solar heater is just so i don't have to add MORE cost by using the heater. So, please just any advice on the 3 questions above? 2. it will increase the back pressure at the pump but without knowing the pump specification it's not possible to say if it will be 'harmful' - look for a pump with a decent 'head' capability and it's less of an issue. i just remembered i'd decided to get a higher quality pump with better ratings when i bought it. picture below may give some info that helps re pressure, i dont know. does this look any good - Bradas WFC1/230 Garden Carat 1/2 Inch 30 M Black - from an online store most people know? what would be the best way of coupling it to the bigger pipe? copper with jubilee clips maybe? The single heat box warmed it about 4 degrees on a hot day . Sure that 4 degrees wasn't as a result of it being a hot day ?? The heating systems I know (for hot water) have copper or similar thin pipe that does as many loops as possible inside the panel that absorbs the heat (they may use copper with some silver coating in more recent years). This does not help your project, but they do not use plain water in the pipes but water with antifreeze and transfers the heat to the water in the cylinder via a heat exchanger. No pump is used, hot water moves to exchanger colder comes in at the panel and on it goes. Yes the 4 degrees was on a warm/hot day but that was testing the temp at the bottom which wouldn't have happened with just the sun shining on it. It was both the sun directly heating it and also the heat box. I'm thinking now of not plumbing it into the filter pump but a separate pump with the hose sitting in the water both ends. Something like a pond pump maybe. This wouldn't be on at the same time as the main pump so i could turn the main pump off sooner when it had done it's initial water cleaning job so may be more energy efficient. Also i could get one that the hose fits directly to rather than stepping down the size. It may also send the water through slower. I haven't said yet but I'm not expecting 30 degrees just maybe raise the usual 16 degrees it starts at each morning (currently) to about 24 which is what the heater was getting it to. I honestly don't think you should use the "pool pump" for your "heating" project. The reason is to pump water through your "radiators" it should go slow, giving it a chance to "warm up" Also as said using smaller pipe / longer distance than recommended will put a strain on your pump causing it to fail. I would be inclined to suggest a central heating circulator (and change the impeller housing to a plastic one to prevent rust) and use 15mm pipe (dark hose will be fine) and run this to and from your pool. Your "box rad and pipes" can hold say 50L your pool is 8,000 Litres That is 160 times smaller than your pool, how long do you suppose it will take to raise it by the 8 degrees you are wanting? by that time the sun will have set. The only way it will work is if you increase the number / size of your box rad pipes considerably. It works in home set ups as it uses a heat exchanger and a considerably smaller volume of water, therefore I would suggest you have a good idea, but in reality it will not work as good as you hope. Can I run a hose and drain a small pool right into this?